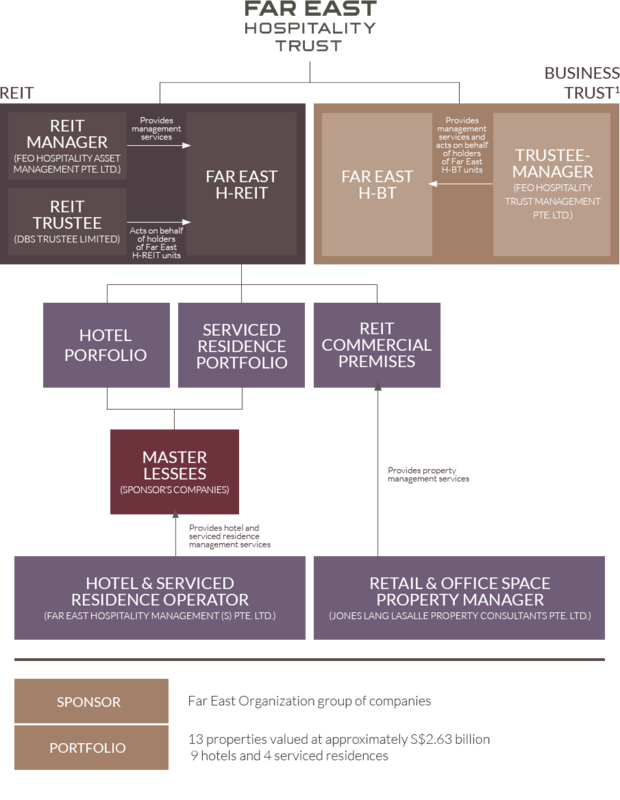 Far East Hospitality Trust consists of Far East Hospitality Real Estate Investment Trust (Far East H-REIT) and Far East Hospitality Business Trust (Far East H-BT). Far East H-REIT holds 9 Hotels and 4 Serviced Residences and is managed by the REIT Manager, FEO Hospitality Asset Management Pte. Ltd.
Each of the 13 properties is under a Master Lease Agreement where the Master Lessee will pay a rent that comprises a fixed rent and a variable rent from the respective property's revenue from operations. The Hotel and Serviced Residence Operator is Far East Hospitality Management (S) Pte Ltd.
Far East Hospitality Trust has a total of 286 units of retail, office and serviced office commercial spaces (or excluded commercial premises) housed in 9 of its properties. The Property Manager of these spaces is Jones Lang LaSalle Property Consultants Pte Ltd.
1 Dormant since Listing Date and master lessee of last resort.